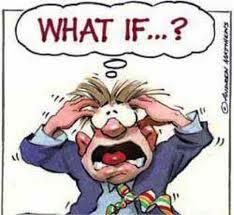 Recent news regarding potential changes in my own professional career have me doing a lot of thinking, wondering, guessing, and even worse, worrying about what might transpire regarding my financial future. When I sat back and continued to worry I remembered the advice I had always given to others but failed to incorporate into my own life…worrying is not going to change the end result, action is what is going to, and will, change things. I have wealth in ability, gifts, talents, loved ones, family and friends that will always have my back and ensure that I will never stray from the path to success. My belief is that WE ALL have these gifts and have to remember this truth at all times, especially when we think times are in turmoil or have the potential to get rough. Keep faith in yourself and in those aroundyou and know that you will not ever fail to accomplish your goal or dream as long as you believe and take personal responsibility and action in your life. Never sell yourself short or discount the greatness and untapped potential that lays within you. Today, and everyday, I have faith that we are all destined to create greatness in ourselves and in the lives of others! We’re not too old! Howdy folks! It’s been a while since I’ve posted on this blog as I’ve been focusing more on my Step-Dad Diary site (www.stepdaddiary.com) which I hope you’ll take the time to check out. Nevertheless, this topic has been on my heart recently so I thought I’d share as I’m sure many of you are in the same boat. The bottom line up front is that I’m a worrier! There are healthy levels of worry, I believe, but I think I walk the thin line of unhealthy worry. With another child on the way I worry that I will be able to provide for my newborn throughout his years as have for my other biological son and two Step-Children (which I gladly do as their fathers don’t really step up to the plate all the time.) I worry that my job might be gone tomorrow (which it always could as I manage a non-profit,) or that my wife and I won’t continue to grow old together and enjoy each other like we do now. Financially, I know that we can make it one way or another through military retirement, taking on extra jobs if need be or whatever but those realistic facts don’t always sink in when I wish they would would. Rather, I find myself letting negative thoughts or worst-case scenarios take control of my thoughts and when they take control of my thoughts they often take control of my mood which resinates throughout the home or everyone around me. It’s so simple to do and we should look for others experiencing the same types of thoughts and support them. In supporting them, it turns out to be a win-win situation in that we start to believe in ourselves as well. Even writing about it, as I am clearly doing here, makes me feel better even though I doubt it will be seen by many. Perhaps one person will be able to read it, relate, and know that things are always going to be fine. Worrying does no good, what will be will be. We can only be proactive and make the best decisions we think we can at any given time. If something unexpected bad happens we’ll deal with it when the time comes. Wow…it’s nice to be able to have a venue to share this stuff. I hope you always focus on the good and choose not to worry when there’s really nothing you can do about what MIGHT happen down the road! In the meantime, take good care! Yes indeed, time sure does fly by in so many ways! It’s amazing to watch things change all around us, especially our Kids. Sometimes we inadvertently miss crucial moments or dismiss the small things which prove just how old our Children are getting or what’s really going on in their lives, or even our own! One small, but significant example is my little dance diva, Aleah, just got a new pair of girlie “Jordans!” Never in a million years would I have thought she would want anything of the sort or run around afterward saying “ Whaaat? Whaaat?” but it happened just before my eyes. Now she looks like a cute little hip-hop dancer which she hated less than a year ago! I’m still baffled as to how this transformation took place or what sparked this transformation but I’m good with it! Luke now has a new iPod and is getting so technically savvy at the age of six that it’s amazing! The other day I tried to FaceTime him but was unable to so I called his Mom. She asked him if he had his wi-fi on apparently he didn’t which was the problem. So, he turned it on and we were able to chat “face-to-face.” I asked him if he knew what wi-fi was and he explained it to me well and further explained that he turns it off and on depending on where he is and also ensures his Bluetooth is off to “conserve battery life.” Who would have thought that a six year old guy would have known what he was explaining to me. Heck, there are adults out there who don’t know some of that lingo. Zack, the teen, knows a so much about many things, technically and otherwise (though he chooses not to use that knowledge from time to time) and seems to gain more knowledge each day. He’s also growing like a bean sprout (which I’m hoping will cease soon before he eats us out of house and home ) Nevertheless, he’s changing on a daily basis as well in so many different ways. As my Kids’ grow and change I have to remember to allow them to change accordingly, become themselves, but also to steer then in the right direction. Not in a militant fashion (unless it’s called for) but rather in a way that lets them know that what they choose to do now and the effort they devote to different things will ultimately help or undermine their future. It’s up to them to choose what’s really important and what they want to focus on. I am going to do my part to ensure they know and understand the “cost-benefit analysis” of what they choose to do and ensure they are doing at least the things they are supposed to do…get decent grades, be respectful, keep their word, etc…but in the long run they are going to who they want to be and do what they want to do…within reason. My goal is to help guide their way. The time sure is flying by and before they know it, they’ll be on their own wondering if they’ve made the right choices. I will ensure they have a kit bag full of all the information and guidance I can possibly give them before that time! My Son and Step-Kids deserve at least that much from me and I won’t let them down! I welcome any and all thoughts you have on this subject! There are so many things going on from day to day between family, work, obligations, hobbies, etc…that it’s often hard to manage everything at once. I always hear that I need to set a list of priorities and work from there but that it difficult in itself. For example; Quality time with my Kids and family need to be of the highest priority but how can I put that above going to work and fulfilling the needs of my job at the highest level possible. Sometimes, that’s easy as the Kids are gone and I can focus solely on work (which sometimes requires me to develop presentations, attend functions, etc… on weekends) but that’s okay because the Kids may be gone, my Wife at work and me home alone to focus. Other times that’s not as easy as I may have focus my efforts on the same types of task while my Kids are home looking for some quality time and attention. The bottom line is that it’s doable. Doable in terms of “do what you can when you can do it!” Maybe I don’t have time to engage in my hobbies one day or week but that’s okay, there will be time at some point. I had plenty of “free” time this weekend to do just that but I was feeling under the weather with a sore throat and sinus pain (seems to be going around recently…especially in my home!) That’s just life…and I couldn’t foresee that coming but it did and I dealt with it. So rather than sit and bask in my facial misery, I watched a couple movies with the kids and even went so far as to start watching episodes of “Once Upon a Time” with my wife and Step-Daughter…pretty girly fairy tale series but we all seemed to enjoy it nevertheless. This isn’t our normal genre of flicks but we all kinda got into it and really enjoyed both the series on Netflix and the time we were spending together. Zack was a little too “cool” to watch it with us but that’s understandable as he is 14 years old and a boy so I can’t blame him in the least. There’s always so much going on in our home on a daily basis, especially during the week between dance classes, football practice and games, work, doctors’ appointments, household chores, etc…that it really is difficult to set a list of priorities. It really does take some mastery of juggling these things but above all, working as a team with Lisa to make it all happen is essential. Perhaps setting a list of priorities at the beginning of each day is more beneficial than trying to set an ongoing list that stands firm. Values are something that don’t have change such as service, ethics, manners, God, love, etc… but maybe setting a daily priority task is better than trying to set a priority task and leaving it alone. Maybe I can set a list of priorities for a few days or even a week but they might need some tweaking or adjusting as the time goes by…we’ll see because that’s what I am going to try and do! I know one “priority” that doesn’t require me juggling, just requires me to ease up a bit (as I know I’ve said before) in my own home is to stop being so “knit-picky”…that’s really not going over so well and I know I should save that sort of stuff for when I really need to “bust it out” otherwise it might not be quite as effective! 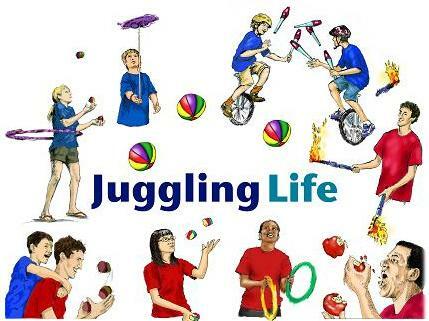 Anyway, happy “Mastering” your juggling Step-Dads! Let me know how it all works out for you or if you have any advice for The Step-Dad in training! Hit me at brett@stepdaddiary.com . I’ve been doing my best to keep the spam emails and comments down so I moderate them all before they’re posted but rest assured…if something good comes along, I’ll be sure to re-post or share accordingly! Love, Time, Attention…Give It Freely! Yes, the items mentioned above are important to instill in my children (Son, Step-Son, Step-Daughter) but they can’t be the sole focus of interaction I have with them. There needs to be a healthy balance of discipline and just plain old fun bonding time. For example, if I want Zack to open his door for a while and crack the windows to get some fresh air in then I am far more likely to get positive results without attitude if we have recently spent some time throwing the football, going out to grab some food together, or something along those lines. Additionally, that bonding time spent doing the “good” stuff may inspire him to open up about his daily life and tell me what’s really going on with him from day to day. Perhaps there are some things he really wants to talk to me about but is turned off because I may come across as too “bossy” or “militant” at times…I don’t know but it’s worth a shot! Girls might seem a little tougher for men to relate to at first. Aleah is into dolls and dolls really freak me out for some reason but I’ve noticed she also likes to play iPod games or get on the computer with me. She likes to color, write, and even excel by practicing math problems which I’m all in for! Maybe that’s a bonding opportunity in itself! The bottom line is that all our Kids, Step-Kids or Biological, are longing for our attention. They just want to know they are loved and we have to make time to ensure they internalize the fact that we do love, care, support, and want the best for them. I have been great at instilling a “sort” or discipline but I really need to work at the playful bond effort to be more effective in all areas. It’s important to me for my Kids to see and respect me not only as a dictator or rules but also as a comforting, loving, and reliable confidant. Best of luck to each of you! Step-Daddin’ ain’t easy…but it’s definitely rewarding and I wouldn’t have it any other way. 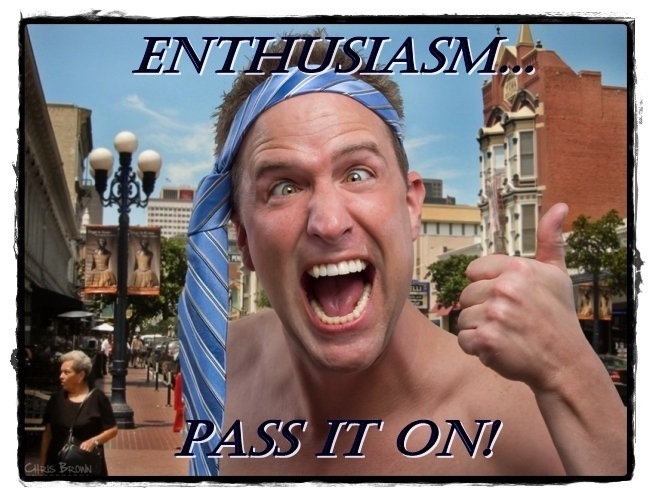 Enthusiasm is the root each of us possesses to obtain or accomplish anything and everything. We’re talking simple tasks from getting out of bed in the morning to running a marathon. Without any level of enthusiasm we will accomplish absolutely nothing. Sometimes things seem hard and cause us to sit back and say “I just can’t do it right now” or, “I just don’t have any enthusiasm right now but hopefully I’ll spark up later.” It’s times like these when it really takes some fortitude and looking toward what we could only accomplish if we just don’t just succumb to our own lack of motivation. I have to admit that at times I have been bankrupt in the enthusiasm department and have definitely felt the ramifications of not accomplishing tasks I had initially intended on accomplishing. Problems, tasks, work, and especially promises don’t disappear because I just didn’t feel like doing them at the moment. Many of us have families, friends, co-workers, etc…who count on us on a daily basis and a lack of enthusiasm or willingness on our part can cause nothing good to be accomplished. One might argue that you don’t have to be enthusiastic to accomplish what needs to get done but it sure does make things a lot more enjoyable and your enthusiasm can be contagious to other who may be lacking in the same area. I know it might seem like a sort of random topic but I came across this great quotation when I was seeking some good reads on motivation. I, for one, choose to be “bankrupt” in no area whatsoever and this is one that seems of the utmost importance! 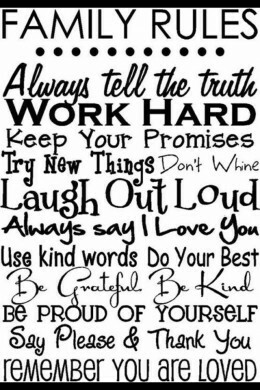 If you found a way to gain or maintain a healthy enthusiastic level to accomplish life’s daily ongoings that’s awesome! Try and find someone who hasn’t seemed to reach your same level of drive and lift them up to your level as well. I think the world will appreciate it! Take good care and lead yourself to bankruptcy! Keep on Keepin’ on! It’s that the truth! Lean over to pick up 25 pounds and you just might hurt your back to a great degree. If you squat, grab that same load, and stand straight you then you’ll likely end up with no problems at all. Funny how that all works! The bottom line is that it’s not necessarily the task at hand that can wear you out either physically or mentally, but how you choose to either handle or in some cases, not handle it! We all have burdens, trials, tasks, and otherwise that we are either responsible for on a daily basis or that may pop up out of the blue and strike us from the blind side. Often times we take these battles full on or without asking for help and overwhelm ourselves to the extent that we feel lost or even helpless. We sometimes tend to carry with us unnecessary weight that we just don’t need or can handle alone. Why not stop, see what’s wearing on us or beating us down, think of alternate means of addressing the issue at hand, ask for help when we need it and break adversities down into small, more manageable tasks or “chunks”…smaller more “light” loads seems to be a great way to carry the “bigger” heavier and potentially damaging load or burden you may be facing. For example, maybe you’re practicing or preparing for a 10 mile run. In the past the furthest you’ve run without stopping may have been 5 miles. 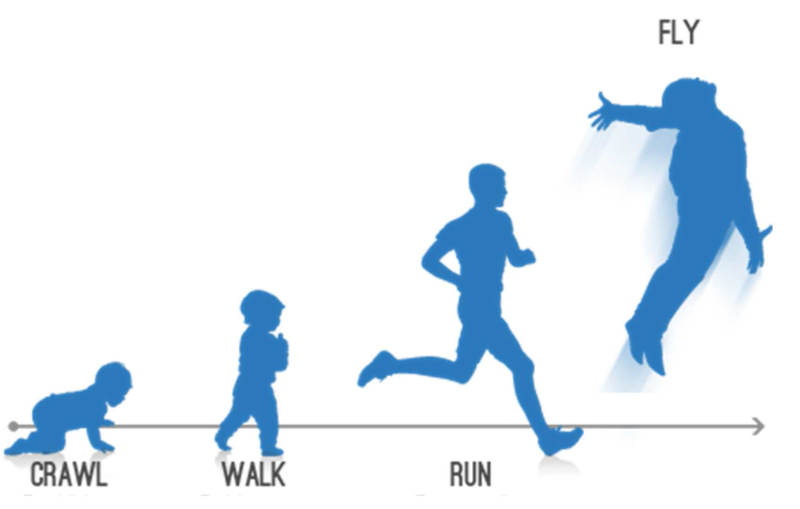 So, rather than go straight from 5 to 10 miles (which you would likely not be able to accomplish with ease) you decide to start early and build your stamina 1.5 miles at a time. You run 5 miles for a while…kick it up a notch to 6.5 miles for a couple runs, then 8…then 9.5 or even 10 and keep on going. You get the point. Don’t be overwhelmed by looking at a single task without seeing how you can break it down into more small, manageable tasks that won’t be such of a trial. I have found that in trying to manage one large task that I might fail in the accomplishment of that mission, at least the first time, and though I like to get back up and try again it was a little disheartening to fail the first time. Over time I have become unashamed to ask for help of take small steps to get a job done…sort of the “crawl, walk, run” theme we so often hear about and it seems to work out great! Give it a shot! Just a thought!